With a completely redesigned look, better performance and new comfort features, the 2020 Ford Escape is better than ever. This new model maintains all of its popular features and will be offered with more choices than ever before. It will offer more versatility and smart new technology and will be available with four new propulsion choices, including two all-new hybrids. To create a sportier look for the all-new Ford Escape, designers turned to some of the most high-profile sports cars in the Ford showroom. The shield-shaped trapezoidal grille is inspired by the sixth-generation Mustang, while the lower front end borrows from Ford GT. 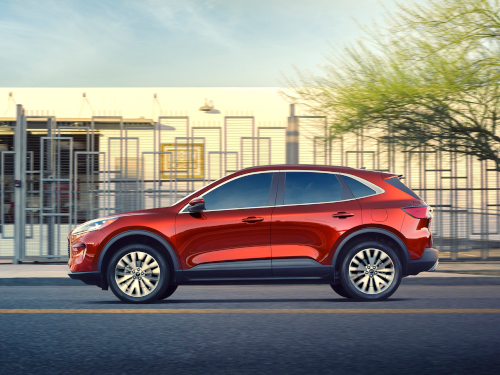 Compared to the current model, the all-new Escape stands lower, wider and longer. Second-row sliding seats are standard across the 2020 Escape line-up. In gas engine-powered models these sliding seats allow rear-seat passengers to enjoy best-in-class maximum second-row legroom with the seats in the full rearward position, plus increased knee clearance and footwell length for a more comfortable ride. With the second-row seats in the full forward position, the rear cargo area extends roughly six inches to offer 37.5 cubic feet of cargo space in gas engine-powered models. The cargo area was designed to accommodate four sets of golf clubs or a full-size dog crate. The new Ford Escape will feature new powertrains and transmission systems, a reduction in weight, improved aerodynamics and updated suspension system to make this new model the best-performing, most fun-to-drive Escape ever. All 2020 Ford Escape models will have an all-new suspension and improved isolation with a new isolated rear subframe. Gas engine-powered models as well as the standard hybrid will be available with all-wheel drive. EcoBoost engine models will have a new quick-shifting 8-speed automatic transmission for smooth, responsive shifting. Our Ford Dealership near San Francisco is happy to answer any questions about this all-new Ford SUV. Please contact us if you would like to learn more about the 2020 Ford Escape and its expected arrival date at Towne Ford. 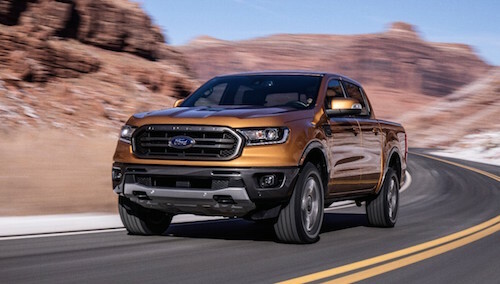 Towne Ford has taken delivery of the all-new 2019 Ford Ranger. This all-new midsize Ford truck has been in development for some time and tested under extreme weather and road conditions. It is tough, strong and offers best-in class fuel economy*. The new Ranger is also offered with an attractive price, making it one of the most affordable new trucks available. The new Ranger has build built to endure harsh environments and driving conditions. Its high-strength steel frame, steel frame-mounted bumpers and off-road chassis components make it abundantly capable on and off pavement. It is powered by a 2.3-liter EcoBoost® engine and class-exclusive 10-speed automatic transmission. A new 4X4 electronic shift feature allows Ranger drivers to engage four-wheel drive by simply turning a dial to select either high or low 4X4 drive modes. With a 1,860-lb payload and 7,500-lb tow ratings** the new Ranger offers best-in class payload and towing capacity. A powerful EcoBoost engine delivers 270 horsepower and maximizes energy to the turbine wheel for responsiveness on demand with virtually no lag. Its remarkable torque rating of 310 lb.-ft allows the new Ranger pickup to haul anything you need for your next adventure. New 2019 Ford Ranger trucks are available with several trim options including the FX4 Off-Road package for the serious all-terrain enthusiast. New Ranger trucks equipped with this package are equipped with tuned off-road monotube shocks, all terrain tires with aggressive tread and traction enhancing electronic-locking rear differential. Ranger FX4 models are also equipped with an advanced Terrain Management System with four selectable drive modes: Normal, Grass, Gravel/Snow, Mud/Ruts or Sand. Our Ford Truck Dealership near Palo Alto, CA currently has a selection of all-new 2019 Ford Ranger trucks to choose from. We invite you to stop by and take a test drive soon. *Class is Midsize Pickups based on Ford segmentation. EPA-estimated rating of 21 city/26 hwy. 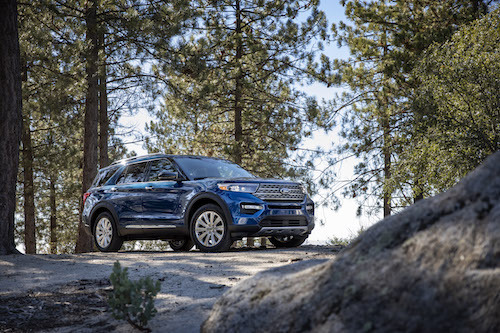 The 2020 Ford Explorer is lighter, leaner and stronger and more powerful than ever before. It is powered by a choice of efficient EcoBoost® engines and is well equipped with smart new technology. This new Ford SUV has been re-designed from the ground up with rear-wheel-drive architecture that enables a sportier, more athletic design. New Explorer models offer improved on- and off-road capability and 600 pounds more in maximum towing capacity when properly equipped. Over a dozen new standard features are included on this model such as, a power liftgate, 2.3-liter EcoBoost engine with all-new 10-speed transmission and a 8-inch digital touch screen with SYNC® 3. This model is also available with an all-new Terrain Management System™ with up to seven selectable drive modes; normal, trail, deep snow and sand, slippery, sport, tow/haul and a new eco mode. Each drive mode is easily accessed with dial in the center console and displayed with special 3D animated graphics in the available new 12.3-inch digital cluster. The redesigned cabin is quiet and well appointed for the increased comfort of all onboard. There are three rows of spacious seating equipped with FordPass Connect, a standard feature that serves up 4G LTE Wi-Fi for up to 10 mobile devices with a compatible wireless subscription service. FordPass Connect gives drivers remote access to their Explorer, allowing them to use their smartphone to lock, unlock, locate and start the vehicle, as well as monitor key vehicle diagnostics. New 2020 Ford Explorer models will be available in standard, XLT, Limited, Limited Hybrid, ST and Platinum trim sets and are expected to arrive this coming summer. If you would like to learn more about the 2020 Ford Explorer please contact our Ford Dealership in Redwood City, CA. After an eight year hiatus the Ford Ranger is now back on the production line. This all new mid-size Ford pickup truck is currently being built at Ford’s Michigan assembly plant. Both the Ranger and Ford’s assembly plant have been reinvented. The new Ford Ranger will offer best-in-class towing, payload and torque. The Michigan assembly plant, where both the Ranger and upcoming Bronco will be built, has been completely retooled with $850 million in recent renovations. During the last two years Ford has been conducting grueling off road and laboratory testing on Ranger prototype models. The new Ranger is rugged, capable and fully modernized for today’s truck buyer who blends city living with off-road adventure. Powered by a 2.3-liter EcoBoost® engine and class-exclusive 10-speed automatic transmission, this new Ford truck offers performance, efficiency and the capability to go anywhere. New 2019 Ford Ranger trucks will also be equipped with driver-assist technologies such as Pre-Collision Assist with Automatic Emergency Braking and an available Blind Spot Information System. This smart new truck also has available SYNC® 3 with Apple CarPlay™ and Android Auto™ capability. TheFord Ranger is expected to arrive early next year. If you would like to receive updates about this new model and its expected date of delivery please contact our Ford Truck Dealership in Redwood City, CA.